Home » new technologies , NEWS » New app for Sleep well is named as "I want to sleep early"
New app for Sleep well is named as "I want to sleep early"
A new app that urges users to put off the digital products and take sleep reportedly locks the phone for good two hours when the user clicks on the 'sleep' button, in a bid to make people more focused on their health. The app called 'I want to sleep early' sets off an alarm every five minutes if the user does not click 'sleep' for the time it has been set, and once the 'sleep' command is clicked, the mobile phone is locked for two hours. Yang Yuan, who has developed the app, said that the intention is to encourage young workers and students to return to the healthy habit of going to bed early as the app also uses pressure social circles to supervise the users, China Daily reports. 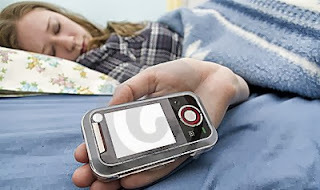 Some users said that the app successfully tackled the worldwide problem of using mobile phones in bed', while others criticized it for being too severe. According to the report, users can choose a option and choose 'giving up sleeping early', which results in an admonitory message being published automatically in WeChat's Moment. He added that the bad habit of using technology while in bed can be renounced through relying on self-awareness to give up staying late and the app works as a reminder. The app has been available for Android systems since August.